Please find details for our mega spec Mercedes Benz A45, Spec as follows: Cirrus White---Black Full Leather Interior---Contrast Red Stitching and Seat Piping---Designo Red Seatbelts---AMG Bodystyling---19" AMG Cross-Spoke Wheels---Red Brake Calipers---AMG Aerodynamic Package---AMG Performance Exhaust---AMG Performance S/Wheel---AMD Performance Seats---AMG Exclusive Package---AMG Night Package---AMG Illuminated Door Sills---Panoramic Glass Sunroof---Keyless Go---Electric Memory Seats---Reverseing Camera---Harman Kardon Surround Sound---Adaptive High Beam Assistant---Bi Xenon Headlamps---LED Daytime Lights----Comand Navigation - Sat Nav---Apple Car Play---Heated Front Seats---Bluetooth Phone Prep---Bluetooth Audio Stream---Mirror Package---Electric Folding Mirrors---Light & Sight Package---DAB Digital Radio---Multi Function S/Wheel---Cruise Control---Privacy Glass---Ambient Lighting---Auto Headlight Activation---Auto Wiper Activation---Air Conditioning---Climate Control. This Mercedes A45 looks stunning in the best colour combo and comes with great extras such as Aero Kit, Sports Exhaust, Panoramic Sunroof, Reverse Camera, Harman Kardon and more! The car benefits from a Full Mercedes Service History. AERO KIT - PREMIUM PACK!! NB: Previous Keeper Guidance: This car may have been previously owned by a car leasing company and may have had more than one driver. For specific details please speak to a member of our team. Our wide range of warranty cover plans are designed to protect your car against expensive mechanical and electrical failure bills and you can make an unlimited number of claims, including the costs of parts and labour. Cover available for all cars of any age or mileage. Authorised claims paid within 24 hours on receipt of the repair invoice. Claims can be settled with the repairer or yourself direct. No excess if you make a claim! ** For exclusions please refer to the warranty leaflet - available upon request. Welcome to Paragon Cars London. To optimise your experience, cookie settings on the website are set to allow all cookies. By continuing your journey throughout the website, you consent to this. You can change these settings here. 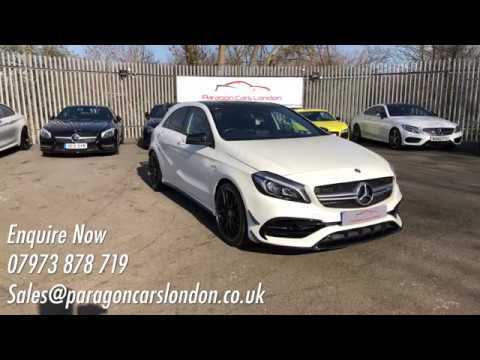 Paragon Cars London is a trading name of High Performance Leasing Ltd.
Paragon Cars London are authorised and regulated by the Financial Conduct Authority under reference number 647051. Finance Subject to status. Other offers may be available but cannot be used in conjunction with this offer. We work with a number of carefully selected credit providers who may be able to offer you finance for your purchase. We are only able to offer finance products from these providers.